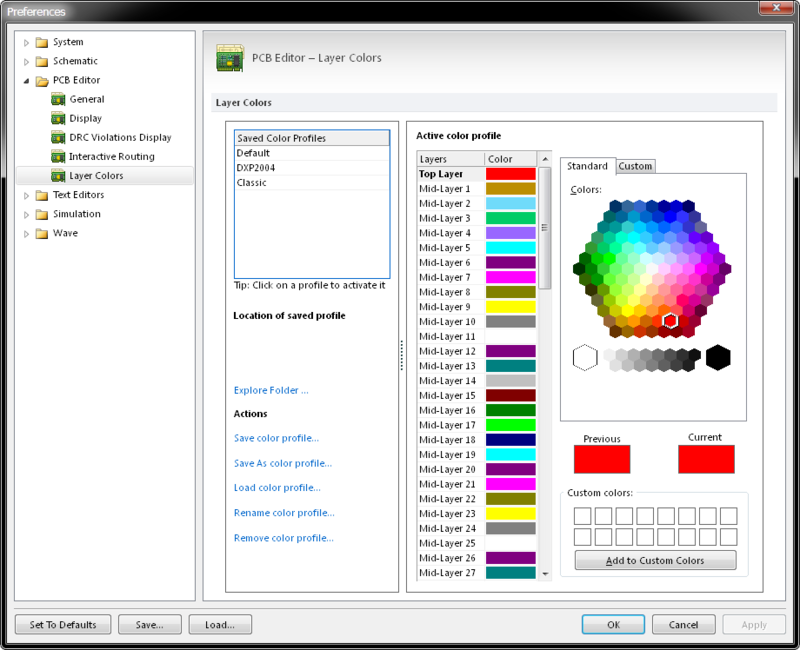 The PCB Editor - Layer Colors page of the Preferences dialog. The PCB Editor – Layer Colors page of the Preferences dialog provides controls that relate to the Layer Color settings within the PCB workspace. The PCB Editor – Layer Colors page is part of the main Preferences dialog (File | ) and is accessed by clicking the Layer Colors entry under the PCB Editor folder, in the left hand pane of the dialog. Saved Color Profiles - Lists the names of the currently saved 2D color profiles. Select a name to view the color profile. Click OK to use the color profile and close the dialog. Location of Saved Profile - Indicates the filepath of a saved 2D color profile. Hover the cursor over a name under the Saved Color Profiles list to see the saved path. Explore Folder - Open the folder location for any saved profiles. Save color profile - Save the currently active color profile with the current color settings. Save As color profile - Save the current color settings into a new color profile. The file name given to the new color profile will be used to identify it in the list of color profiles. Load color profile - Load a previously saved color profile from disk. Rename color profile - Save the current color profile under a new name. This has the effect of renaming the color profile file on disk. Remove color profile - Delete the current color profile from disk. 2D color settings are system-based. All PCB documents will use the current 2D color profile. Layers / Color - A list of all available layers and their associated colors. To change the color of a given layer, select it in the Layers list and select a new color from the Standard or Custom tabs. Standard - The Standard color pattern for selecting the active layer color. Custom - The Custom color pattern used for selecting a customized active layer color. Previous - A color box that displays the color of a selected layer in the Layers column. When a new color is selected for the layer, this box will remain showing the previous color for comparison. Current - A color box that will display a new color configured for a selected layer. When a new layer color has been selected from the Standard/Custom Pattern, it will be displayed in the Current color box. Custom colors - This area shows any custom colors that have been added. A color can be directly selected from this area to configure a new color for an active layer. The default customized color is white. Add to Custom Colors - Click to add the selected color to Custom colors area. To keep changes made to the 2D color settings, save the color profile (from the Actions area) before closing the dialog.